Over 4.8 billion artifacts are held in public trust by more than 30,000 collecting institutions in the U.S. 59 % of these museums and libraries do not have adequate storage space and 80% of these do not have paid staff. Yet almost every museum lists collecting and preserving as the top two goals. The storage space for collections is becoming more and more limited in the MAHS museum. In addition to organizing the current acquisitions into a useable format, it is time to engage in more thoughtful collecting and make greater use of the resources of the community by seeking short-term loans to illustrate the stories we want to present to the public. If we engage our membership and the community as a whole in an effort to give meaning and balance to our collections we will have strengthened our connections with all. Partnering with our community to foster an appreciation of the Mason area and to encourage investment in its future. The impact and influence of changing modes of transportation and technology on the Mason area. GOAL 2: To always be aware of the MAHS organizational capacity (budget, staff, etc.) and storage capacity and to actively seek short term loan of items from the community that will enhance our programming, research, display, and educational missions. MAHS collections should relate to the Mason area from 1836 to the present. Exceptions to this timeline apply to Indian or prehistoric artifacts that have been found in the local area and may pre-date 1836. 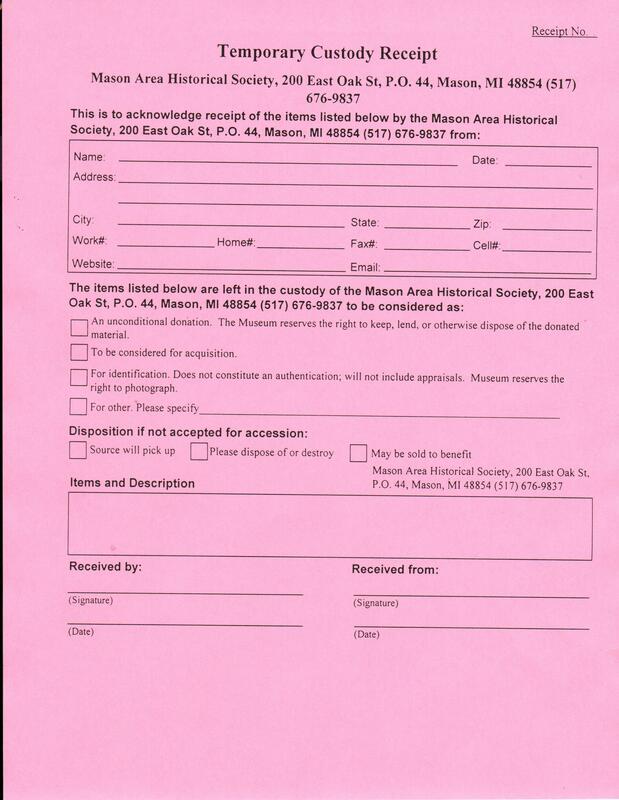 MAHS restricts it’s collecting to historical objects, artifacts, written and printed materials, documents, photographs, memorabilia, and books associated specifically with Mason and the surrounding area. Selected items relating to Ingham County or the state of Michigan may also be collected. Objects should have been made in, written about, primarily used or purchased in the Mason area. There are three exceptions to this limitation, 1) items that have a secondary connection to the Mason area, 2) items borrowed on short term loan for the purpose of rounding out a display, program or educational presentation, 3) items that generally illustrate country school education such as the Pink School. Objects must be in good repair. The only exception is if the MAHS, an individual or an organization volunteers to pay for the needed repairs at the time the object is donated. Objects should not exceed a size or weight that can be moved by 2 people, and must be able to pass through all interior doors of the museum. There must be storage space readily available for the item when it is not on display. Photographs of places or objects must be identified unless they are immediately recognizable, and photographs of people must be identified with at least last names. The exception: any photograph by a known Mason professional photographer will be retained even if the subject is not identified. The only person authorized to sign off on a new donation is the Acquisitions Manager. Decisions as to what potential items will be admitted to the MAHS collection will be made by the Acquisitions Manager and the designated collections committee members appointed by the Acquisitions Manager. If there is controversy among the committee, the MAHS board will have the final decision. No item will be accepted if it in some way adversely affects the museum’s insurance premiums. All items entering the collection will be recorded in the PastPerfect computer software program using the PastPerfect forms (see sample form attachments a-d). Letter of acceptance and thank-you, as well as a Deed of Gift form will be automatically generated by the PastPerfect program. Two copies of the form are sent to the donor asking that one copy be signed and returned to the museum. An alphabetical (by donor) paper file system will be maintained at the MAHS museum to retain signed copies of the Deed of Gift receipts. This information will be photocopied on an on-going basis and kept off-site to protect against theft or other disaster. A separate file will be maintained for items loaned to or loaned from the museum. The PastPerfect program will be backed up on a regular basis by means of thumb drive and external hard drive.